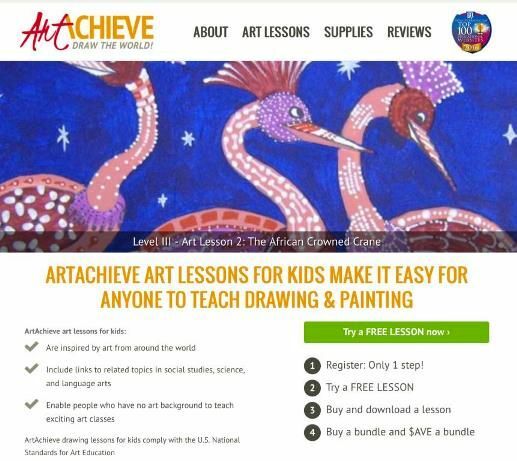 Entire Level II which includes 14 art lessons from around the world. Each lesson takes you to a different country. You get the license for the entire level for a year. You can also purchase the lessons individually if you are learning about a specific country. You do not need to do the art lessons in a specific order which is really nice. You can base your decision on what your student likes to draw, the country that it is from, or even the topic that is being drawn. ArtAchieve is a great go along for a Geography Country study. There is such a range of places that you really will be a globe trotter. Each art lesson gives you a description of the background of the piece of art. For example, the Korean Duck is a traditional wedding gift. Each art lesson provides the materials you will need for that project as well. What I loved was that most of them used the same tools so that made it easier to keep going through the lessons. We used a water color paper that we were able to find at the craft store. Our family has always loved unit studies, and I really appreciate the extra effort that went into these art projects, to incorporate much more than just art. The lesson has 'rabbit trails' you can take and learn more about the art work. There are links for looking up the geography of the area, both in video format and reading. Take the Korean Duck for example again, we were able to see parts of Korea, read about Korean Ducks, and even watch a traditional Korean wedding. The lesson also includes a writing prompt if you want to include that in your lesson. Basically just writing about what you have learned through the video and reading material. Finally there is a literature section that recommends some reading that would either talk about the country or the artwork. All of that is just on the introduction to the artwork page. Once you click on your specific art project, you will have the opportunity to print off a couple of things you will need for that lesson. Their is a warm up exercise that gets you drawing and copying. There is also a small scale version of the art work to look at and learn from. This specific lesson took 65 minutes in time. You can easily break it up into several days. Watching the video and drawing. Then the next do go ahead and do the painting. We typically take a Friday for art, so we like to get our work completed in that day. If you have art class a couple times a week you can easily stretch the project and the additional learning lessons for a week. For the lesson itself you can either have a power point presentation, or you can watch it in video form. We chose to watch it in video. We had no trouble streaming the video and our internet isn't that fast. The video incorporates the background and history information of the art piece as well as showing a traditional one. It also goes step by step on how to draw the item. We absolutely loved ArtAchieve. It is our desire to finish all of the lessons this year, and to incorporate the extra exercises as well. It has been great to have it right there at our finger tips, and not have to search for geography videos and literature suggestions. Check out what the Crew thought on this and the other series of ArtAchieve by clicking on the link below.